In the light of Sri Lanka’s inclusion in the European Union’s (EU) list of high-risk countries for money laundering and the subsequent rejection of this list by the European Council, this LKI Explainer examines the key aspects of money laundering, the emerging challenges and its impact on Sri Lanka. It also explores vital domestic and international legal instruments in force to combat money laundering. The EU blacklist of countries with deficient anti-money laundering (AML) and counter-terrorist financing (CTF) frameworks, which included Sri Lanka, was unanimously rejected by the European Council last week. The European Commission will now have to propose a new draft of high-risk third countries that will address the concerns of the EU member states. In 2018, the European Commission listed Sri Lanka as a country with deficient AML and CTF frameworks. Subject to a new methodology which reflected the stricter criteria of the 5th Anti-Money Laundering Directive (Directive (EU) 2018/843), the European Commission re-published their list in February 2019, including Sri Lanka as one of the 23 countries with strategic deficiencies in their anti-money laundering and terrorist financing regimes that pose significant threats to the financial system of the EU. While the rejection of the list may be of temporary relief to Sri Lanka, it certainly does not absolve Sri Lanka of the incumbent responsibility to strengthen its AML and CTF frameworks in compliance with international standards and requirements. In the light of these developments, it is essential to understand the key aspects of money laundering and its implications for Sri Lanka as an emerging financial hub of the region. Money laundering is a process by which unlawfully acquired proceeds are made to appear to have been derived from a legitimate source. 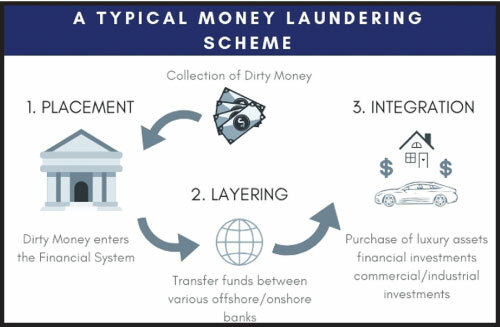 Money laundering follows a three-stage process that involves transferring the cash acquired from illegal activities into financial institutions, obliterating the trail and the origin of the funds, and finally, reintroducing the money back to the legitimate economy, creating an impression of legitimacy. 3. How does money laundering impact society? Money laundering is intrinsically interwoven with criminal activity. Thus, it allows criminals to expand their operations with the accumulated laundered wealth, sourcing further financial activity. It provides corrupt public officials and individuals a method of concealing wealth acquired through unlawful activities such as extortion, kick-backs, bribes or misappropriation of public funds. 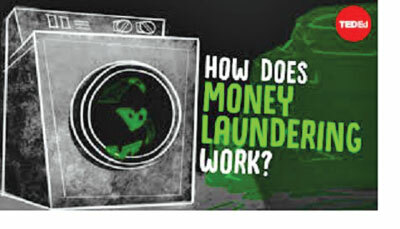 Money launderers often use front companies to commingle the proceeds of unlawful activity with legitimate funds. These can result in the crowding out of private sector business by criminal organisations. Money laundering can potentially shift the centre of the economic power to criminal organisations. Power thus accrued, could have a corrupting effect on all levels of society and effectively weaken the social fabric and ultimately the democratic institutions of a state. This would inevitably lead to a serious erosion of the rule of law. It can also distort the true economic state of a country. Money laundering is a primary method by which terrorist organisations fund their activities. Licensed financial institutions are frequently used in money laundering. The more laundered money that runs through these institutions, the more volatile they become. This volatility can threaten the bona fide investors. The United Nations Office on Drugs and Crime (UNODC) estimated that approximately USD 1.6 trillion, that is 2.7% of global GDP was laundered in 2009. 4. 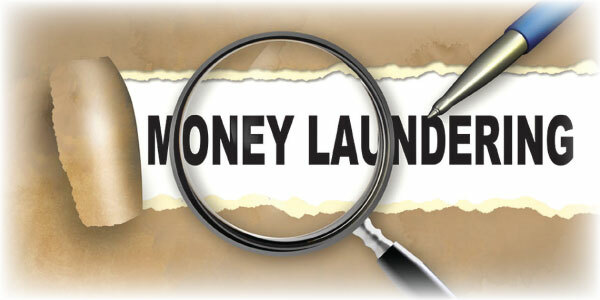 What are the problems in combating money laundering? The increasing methods and sophistication of money laundering provide countries with a complex and dynamic challenge. With the growing complexities of the e-transaction systems and the increasing number of transnational transactions, banks and financial institutions can find it difficult to manage cross-border and multi-jurisdictional anti-money laundering compliance requirements. A key issue is the lack of capacity to investigate and keeping personnel informed of the changes in the regulatory requirements and rapidly evolving technologies used in money laundering. The ‘interception rate’ for money-laundering at the global level remains very low. 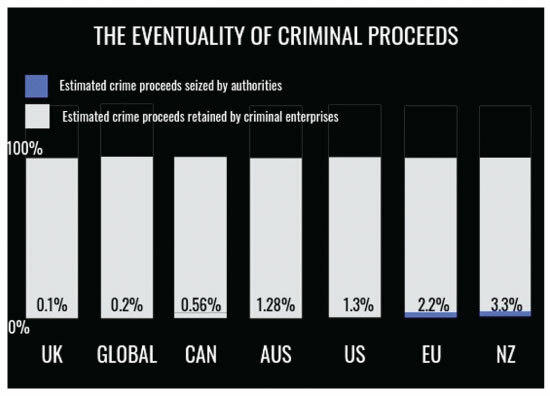 Less than 1% of the proceeds of crime, laundered via the financial system are seized and frozen. The key responsibilities of financial and non-bank institutions regards ‘Know Your Customer’ (KYC) and Customer Due Diligence (CDD) rules, which makes it incumbent on these entities to ensure that they have all the information on their customers, before they enter into a financial transaction with them and that ensuing transactions are in conformity with the information that is available. These entities have the obligation to prove that they acted in probity on the basis of the information collected and in conformity with the KYC and CDD rules applicable to these transactions. President Ferdinand Marcos channelled a purported fortune of USD 10 billion into various offshore bank accounts, foundations and valuable assets making it difficult to be identified and located. To date, approximately only USD 4 billion has been accounted for. Anti-money laundering policies refer to all regulations and laws that mandate financial institutions to proactively monitor their clients in order to prevent money laundering and corruption. *The Money Laundering Act was passed prohibit money laundering in Sri Lanka and to provide necessary measures to combat and prevent money laundering. *The Act established the Financial Intelligence Unit (FIU), an independent institution within the Central Bank of Sri Lanka and acts as the National Agency to collect information relating to suspicious financial transactions. This facilitates the prevention, detection, investigation and prosecution of the offence of money laundering. * Through guidelines issued by the FIU, all financial institutions are required to maintain records of transactions and of correspondence relating to transactions for a period of six years from the date of transaction. *The Director of the FIU reports to the Governor of the Central Bank through an Assistant Governor with regard to its general administrative functions. However, suspicions transactions reported to the FIU are handled independently by the FIU together with the law enforcement agencies (LEAs). 7. Why is it important for Sri Lanka? *With the tighter anti-money laundering regulations in the US and Europe, criminals are moving their money laundering activity into countries with laxed regulations to avoid detection. This puts pressure on regional financial investigation units, financial institutions and associated stakeholders to improve their anti-money laundering (AML) practices. *Sri Lanka is on the European Commission’s blacklist of countries at risk of money laundering. *Although Sri Lanka is not a leading regional financial hub at the moment, with the upcoming Port City and the Government’s ambition to make Sri Lanka a global financial centre, it remains vulnerable to money laundering and financing terrorism. 8. What are the global initiatives and has Sri Lanka met the global standards? * Sri Lanka is a member of the Asia Pacific Group (APG) on Money Laundering, a FATF-style regional body. * Sri Lanka’s FIU is a member of the Egmont Group of FIUs. o enhance the transparency and availability of beneficial ownership information of legal persons and arrangements; and facilitate international cooperation. * FAFT requires countries to rapidly, constructively and effectively provide the widest possible range of mutual legal assistance in relation to money laundering, associated predicate offences and terrorist financing investigations, prosecutions, and possible extraditions. *The various international agreements entered into by Sri Lanka and the domestic legal instruments such as the Money Laundering Act and Financial Transaction Reporting Act provide a sound legal basis for assistance and, where required, extradition. Sri Lanka is a member of various regional and international bodies fighting money laundering. Additionally, Sri Lanka has passed numerous legislations to comply with the international requirements and standards.